Starting July 1, 2008, the loggerhead sea turtle is the official Florida saltwater reptile. A loggerhead sea turtle hatchling heads to the ocean after hatching out of its nest. The loggerhead is the most common of Florida's sea turtles. By the time this hatchling reaches the adult state, it will have increased its weight more than 6,000 times. According to the Florida Fish and Wildlife Conservation Commission (FWC), the loggerhead sea turtle (scientific name: Caretta caretta) is the most common sea turtle to nest along Florida's coast. Its designation as the official Florida saltwater reptile recognizes this threatened species at a time when loggerhead nest counts are down. Typically, about 90 percent of loggerhead nests in the United States are in Florida. 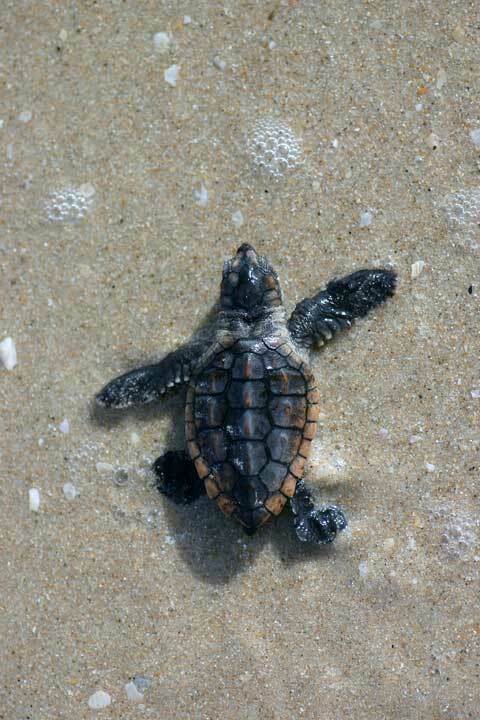 Almost half the loggerhead nests in the world occur on Florida's beaches. Over the past 19 years, Florida's loggerhead sea turtle nest counts have declined 37 percent. The species nests from late April until September in Florida. Hatchlings emerge after incubating in warm sand for two months. The FWC credits students from the Florida State University School's Middle School Science Honors Class for pursuing the state symbol designation during the 2007-08 school year and the 2008 legislative session. The loggerhead sea turtle was one of four symbols the students proposed for addition to the state list. Working with State Representative Curtis Richardson (D-Tallahassee), the students provided information and answered questions regarding the symbols. Richardson amended an already-existing state symbol bill to include the loggerhead sea turtle. The FWC's Imperiled Species Management Section administers protection and conservation of Florida's sea turtles with funding from a sea turtle specialty license plate, which also features a loggerhead hatchling, and from annual sea turtle decal sales. FWC staff assists with research, recovery, beach construction permit review, lighting issues, educational materials and administration in addition to coordinating a network of volunteers around the state who record and monitor sea turtle nests during nesting season. For more information about FWC sea turtle research and management programs, visit MyFWC.com. The turtle is named for its large head, which may be 10-12 inches wide. Powerful jaw muscles enable the loggerhead to crush heavy-shelled clams, marine snails, horseshoe crabs and crustaceans. Loggerhead turtles reach maturity after 20-40 years and could have a lifespan of 70 years or more. Adult turtles weigh 200-350 pounds and measure 4 feet in length. Hatchlings are 2 inches long. Threats on nesting beaches include habitat alterations from coastal armoring and beach lighting. During the nesting season, females remain in shallow areas near their nesting beaches. The loggerhead moves on land by using diagonally opposite flippers at the same time. The center of the track looks like a wavy line in the sand. After nesting, loggerheads disperse to feeding grounds throughout the Bahamas, Cuba, the Dominican Republic, north along the eastern U.S. coast and south through the Florida Keys and the Gulf of Mexico. Once a nest site has been chosen, a body pit is excavated by digging with four limbs and rotating the body. This removes the dry surface sand that could collapse, and places the egg cavity at a greater depth. When the body pit is complete, an egg cavity is dug using the cupped rear flippers as shovels. Two-thirds of the time involved in nesting takes place after the eggs have been laid as the female covers and disguises the nest. Turtles are not easily disturbed once egg-laying has begun. The vulnerable time for disturbance occurs during emergence from the water, ascending the beach or when digging a nest cavity. Sea turtles may abandon their nesting if they are bothered by lights or unusual activity nearby (motion on the beach, sounds, etc.). Loggerhead turtles will nest at 12-15 day intervals throughout nesting season. If you happen to see a nesting sea turtle while you are on the beach, stay behind her and at such a distance that she cannot see you. Keep all lights off (flashlight, flash from cameras or videos) unless you have an approved filtered light source. Avoid excessive movements on nesting beaches. Give the turtle space to return to the water and do not hinder her progress. Understand that digging up eggs, interfering with nesting (before, during or after nesting) or sitting on sea turtles is harmful to sea turtle survival and is illegal. Report sea turtle harassment to the FWC Wildlife Alert Hotline 1-888-404-3922. Keep the beach dark by keeping light sources hidden from the beach during nesting season. Sign up for FWC-sanctioned guided sea turtle watches so you don't unnecessarily disturb nesting sea turtles. Before nightfall, remove beach furniture and other obstacles on nesting beaches. Keep the beaches clear of plastics and debris, especially near the dune line. If you like to dig large holes or moats when you visit Florida's beaches, excavate close to the surf line and fill the holes back in before you leave the beach. Keep your pets leashed if you walk your animals at night on beaches where pets are allowed. This green box enables visitors to discover the businesses, attractions, activities and services of our North Brevard communities. The participants in this directory are working together to build appreciation of our entire community. It is supported by paying business customers, your response to our advertisers, and donations of appreciative users. Your Titusville area business web site, web page, or web card on this Community Directory. We can register, produce, host and market your Internet domain.